HEAR: We encourage all our people of their inheritance in hearing God’s voice. EXPRESS: From that, we then instruct and encourage them in expressing what they hear in a good prophetic culture of gifting and character. REFINE: Out of that will emerge a few with prophetic ministry that we refine working in team. 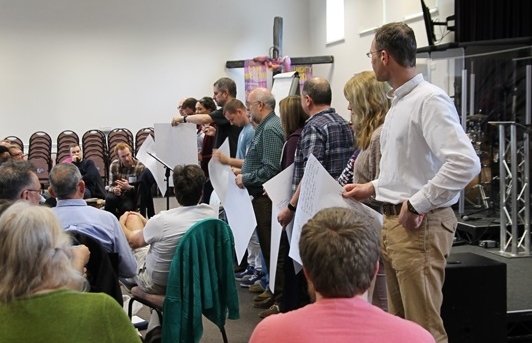 The vision is for mature prophetic ministry working in teams locally with elders in their local churches, and serving wider in Relational Mission. More than a dozen churches have now started to gather and encourage their folks in the prophetic. Last year, I sent out a survey to the leadership teams of our churches and church plants to catch the prophetic pulse as to what the prophetic looks like for them, and what they are currently doing to encourage and develop the prophetic. A very common reply in the survey was how to further develop those with emerging prophetic gifting beyond the basics. In response to that need to connect and equip those emerging at a higher level, we asked leaders to nominate and send a few of these individuals to a Prophetic Masterclass which Angela Kemm and I hosted on 14 April. What an incredible day it was! There were close to 70 people from 30 different churches represented! We were encouraged by the buy-in from the churches. In the morning, we had four sessions that were split between a short talk and time for discussion in small groups. This really helped people to earth and apply what they heard. We discussed “The Making of a Prophetic Heart” by Joseph’s life; “Growing Fat Words” – understanding the various levels of the prophetic, and believing God for more; and “The person behind the gift” encouraging us to make sure our character and heart kept up with our gift. Lastly, we explored the different ways that the prophetic is expressed in our other mix of gifting, apostolically, pastorally, evangelistically, and in teaching. In the afternoon, we took time to share what God was speaking to us. We also talked about the opportunity and the challenge we have with the Courage Conference in how we bring contributions in a large gathering. We talked about having prophetic ministry working together to catch God’s heart, and to have an individual express that in the gathering in an inspiring way. We then finished our time learning to prophesy together in teams. For me, this was such a significant day. First, this was a room full of quality people with such good hearts. It was a great opportunity to connect with the various pockets of prophetic groups in our family of churches. It felt like we came together with a common language and heart to see God use us more and more in the prophetic. We spoke a lot about our hearts and our character, and you could sense a real openness in people in their discussions. This day has proven to be a great way to gather together to learn to connect more with one another. We will be looking to do more of these, especially in various regions of Europe where it was difficult for people to travel from for the day.